Two recent passport size colour photographs (35 x 45 mm in width) with a plain light background (white or off-white), close-up 70-80% of the photograph. Photographs taken with a digital camera must be high quality colour and printed on photo-quality paper. One photograph to be pasted (please do not staple) on the visa application form. The second one to be attached with a paper clip to the form (should not be pasted or stapled).Scanned and color photocopies will not be accepted. Latest 6 months personal & company's bank statements should have the bank seal. For employees: Latest 6 months salary slips and salary bank account statements with bank seal. NOC from employer in case of employees. IRCTC will not encourage visa on arrival. Kindly ensure that your passport is valid for minimum 3 months beyond the stay, ECNR/POE formalities completed, etc. Two passport size photographs and copy of passport & pan card in full duly signed by the customer need to be submitted to IRCTC within three days of the booking. Please reach the airport 3 hours before the departure of the flight. IRCTC will not responsible for missing of flights by the guest. Transfers and Sightseeing tours are on SIC (seat in coach) / shared basis by A/C vehicle. Arrival / departure transfers & sightseeing tours shall be provided as per schedule. However this may require you to wait at the airport for short duration until all the guests arriving at that time exit the airport. It is mandatory to carry the age proof of children (02 to 11 yrs) and infant (below 02yrs) as well along with other travel documents. Child above than 11 yrs shall be considered for an adult cost. Room allocation (Twin bed / Double bed) is at the discretion of the hotel. Number of meals is always corresponding to the number of nights booked. Breakfast is not provided on the day of arrival. The airfares and taxes are calculated as on a mentioned date and any increase in the Taxes or airfares will be borne by the customer. For any change in Flight Timings/diversions, Flight cancellation from the airline IRCTC will not be responsible and if it further affects the Sightseeing/Itinerary client need to accommodate accordingly. Buffet/Fixed meal will be provided at fixed venue decided by the hotel. You are kindly requested to check the perfect buffet timings at the time of check in at the hotel. Once the buffet time is over the hotel might ask you to pay for your meals. IRCTC request you that before finalizing the tour with us kindly go through the website of the hotels and read the reviews. Package cost is calculated on lowest class Air Fare. Any increase in air fare or air port taxes has to be borne by the client. Any Itinerary posted on the website is only a proposed holiday outline. In case there is any change in price the same will be communicated to yourself and only after your confirmation, we will proceed further. There will be no refund for un-utilized services. The package Price is subject to change without prior notice. Passenger should get full briefing about the tour from IRCTC before/after the booking to avoid any confusion. IRCTC is not liable for personnel expenses, boating, porterage, theft, accidents etc. Any other terms and conditions applied as may be decided by IRCTC at any point of time. 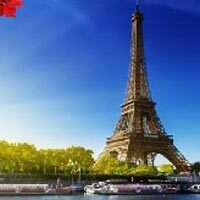 Switzerland & Paris:- Europe encompasses an area of 10,180,000 km2 (3,930,000 square miles), stretching from Asia to the Atlantic, and from Africa to the Arctic. European countries welcome more than 480 million international visitors per year, more than half of the global market, and 7 of the 10 most visited countries are European nations. It's easy to see why - a well preserved cultural heritage, open borders and efficient infrastructure makes visiting Europe a breeze, and rarely will you have to travel more than a few hours before you can immerse yourself in a new culture, and dive into a different phrasebook. Although it is the world's smallest continent in land surface area, there are profound differences between the cultures and ways of life in its countries. Any other terms and conditions applied as may be decided by IRCTC at any point of time.Lunches during the tour. Any increase in Airport Taxes, Fuel Surcharge, Visa fee will be payable by passenger. Anything not included in the inclusions. On arrival, you will be met with Local Representative outside the customs area and Transfer to Engelberg after doing short orientation city tour of Zurich. On arrival check into Hotel. Later, proceed for Lucerne City (35 Kms) tour from Engelberg. Dinner at Indian restaurant. Overnight at your hotel in Engelberg. After a continental breakfast, proceed for full day excursion to Mt. Titlis. We begin the tour with a visit to Mt. Titlis, which at 10,000 ft. is the highest peak in central Switzerland. As you journey to Mt. Titlis through a series of three different cable car rides, you will be amazed as the scenery changes from green meadows, scenic lakes to snow clad mountains. See over 200 cable cars sporting different flags. Lookout for cable car number 73 that carries the Indian flag! The last leg of the ascent will be in the world's first rotating cable car called the 'Titlis Rotair'. At Mt. Titlis you have free time to play and enjoy in the snow, visit the Ice Cave or just relax at the restaurant. At the Terrace on top of the Mt. Titlis summit station, weather permitting, you could take an unforgettable ride on the "Ice- Flyer" an enclosed ski lift that travels only a few meters over the Titlis Glacier. (weather permitting). Remaining day is Free at own Leisure. Dinner at Indian restaurant. Overnight at your hotel in Engelberg. After a continental breakfast, Proceed for scenic drive to Lauterbrunnen, from where we board a train to Jungfraujoch, the highest altitude railway station in Europe at 11,333 ft. takes us along lovely lakes and mountain passes. Marvel at the changes in the Alpine scenery as your charming cog-wheel train takes you on a unique journey. Experience the magic of the mountains at the Sphinx Terrace. See the breathtaking Jungfrau Peak and the awesome Aletsch Glacier. Also, visit the Ice Palace, where you see a beautiful display of sculptures made of ice, while being encased in ice yourself. Have a memorable encounter with eternal snow and ice at the Plateau. Thereafter proceed to Interlaken (17 Kms) City Tour, one of Switzerland's best-known health and pleasure City. There's time to relax at the many cafes or shop for Swiss watches, chocolates etc. Dinner at Indian restaurant. Overnight at your hotel in Engelberg. After a continental breakfast, check out from hotel and journey (700 Kms, 7 hours drive) towards Paris by Coach. In the Evening, arrive Paris - the fashion capital of the world. On arrival, check into the hotel. Enjoy natural beauty on the way. The evening is free for you to relax. Dinner at Indian restaurant. Overnight at your hotel in Paris. After Breakfast we start our Guided Paris City Tour. We take you to the 2nd level of Eiffel Tower from where a bird's eye view will leave you breathless. Later, proceed on a panoramic city tour of Paris conducted by a local guide. See Paris in all her charm, glamour and glory. See the Obelisk at Place de la Concorde, the largest and the loveliest of the Parisian squares and the majestic Arc de Triomphe. Also see the Champs Elysees, arguably the most well known avenue in the world, the magnificent Opera, the striking Town Hall and the National Assembly, the famous Notre Dame Cathedral. After City tour Enjoy Indian Dinner at Night. Today Late Night (23:30) you can enjoy Lido Show (at Extra Cost). See the finest combination of beauty, rhythm and gaiety. Experience the charm of striking ballets, shimmering costumes and talented dance troupes. A perfect end to this beautiful evening!!! Overnight In Paris Hotel. Today Day enjoy Full day Tour of Disneyland. Day for magic and enchantment. Enjoy breakfast at hotel and proceed to the Disneyland Parks. You will receive a one-day pass for Disneyland parks. The Disneyland Park with its 5 magical lands, exciting rides and attractions, larger-than-life Disney characters and an endless array of shows and parades leaves you breathless for more. The magic never ends here. Dinner at Indian restaurant. Overnight stay in Paris Hotel. After breakfast. Check out from hotel. Transfer to airport for flight back to India. *Child fare of age below 2 years need to be deposited in cash by customer at IRCTC office at the time of booking.